This month sweet punch was Whole wheat Eggless cookies from this cookies is absolutely easy that can be done in no time, healthy( if your not counting butter calories :) ). 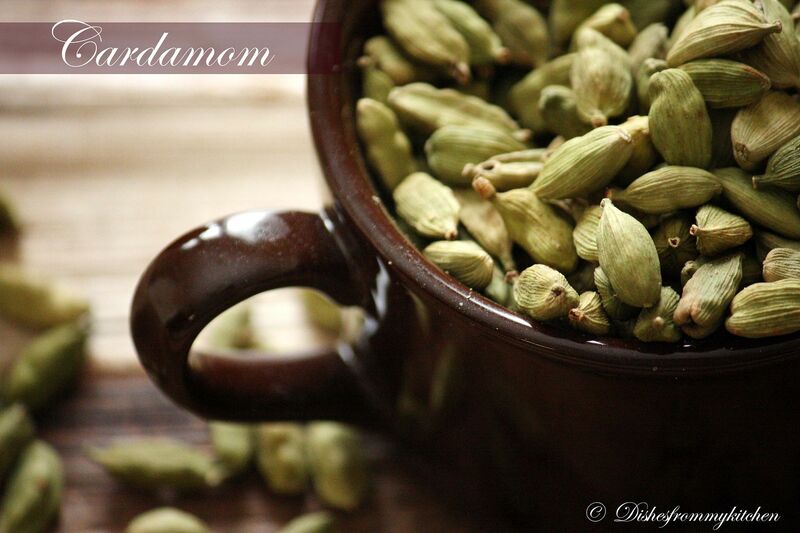 Pre heat the oven to 360 degree F.
In a bowl, mix the flour, sugar, salt, almond meal and cardamom powder well. Next add soft butter and milk to the flour mixture to make dough. Dough should be very soft. Divide the dough into about 24 equal parts and make them into balls. Press each ball between your palms lightly; every piece should be about 1/2” in thickness. 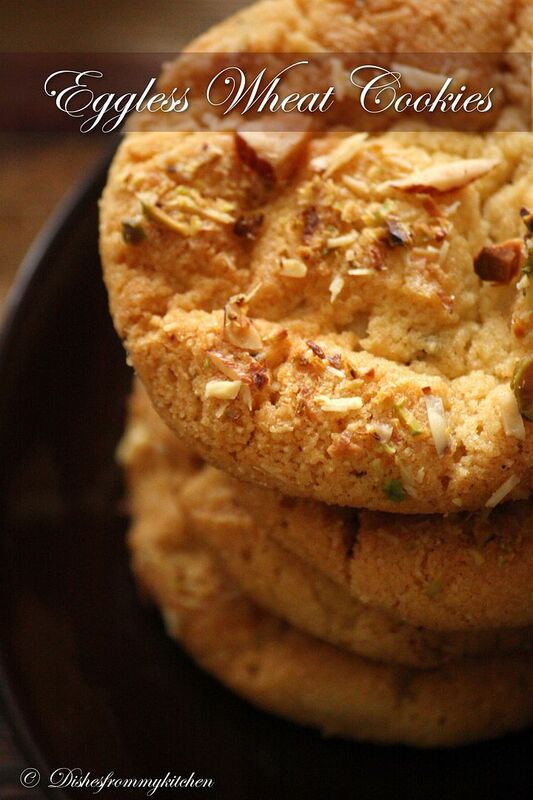 Place the dough balls on an ungreased cookie sheet about inch a part, garnish with pistachio and Silvered almonds. Bake the cookies for about 18 minutes or until cookies are lightly gold brown. After they become lightly golden brown remove the cookie sheet from the oven. Let the cookies cool down for two to three minutes before taking them off the cookie sheet. 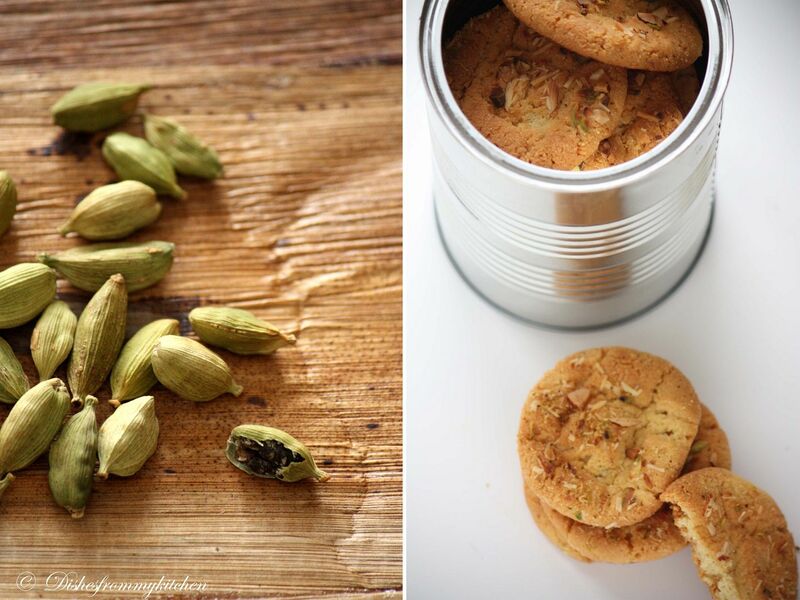 Store the cookies in the Airtight container and enjoy the goodness of the wholewheat with the aroma of the cardamom and crunchiness of the nuts. Beauuutiful looking cookies and pictures, pavithra! as always a poem! What an amazing click, looks beautiful and yum! This is so gorgeous... and picture perfect... Adore your clicks! Almond meal means?where we get that? 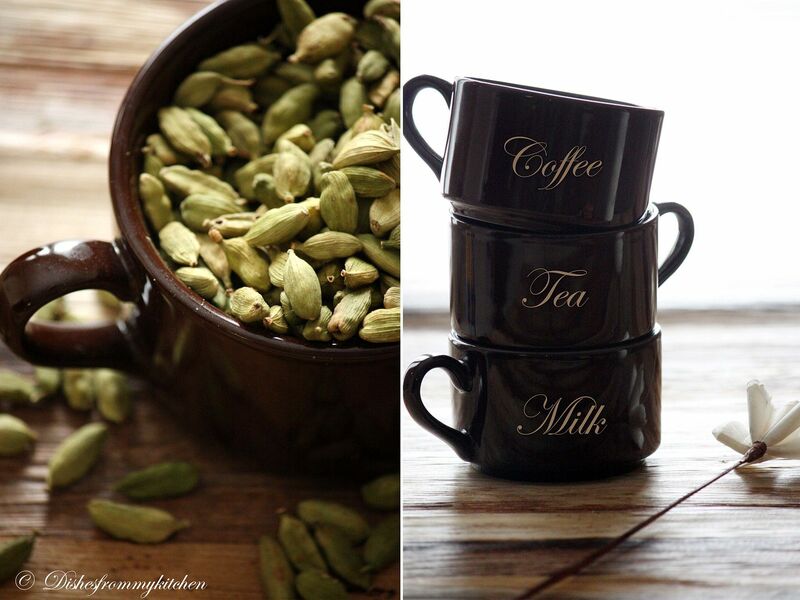 Beautiful clicks..looks so perfect n yumm!! @Divya Almond meal is powdered almond Divya. You can make at home. Pavi - Gorgeous is not an word enough to describe what I want to. These just look huggable pretty! As always looks gorgeous Pavi, loved your presentation. thats a luvly click! 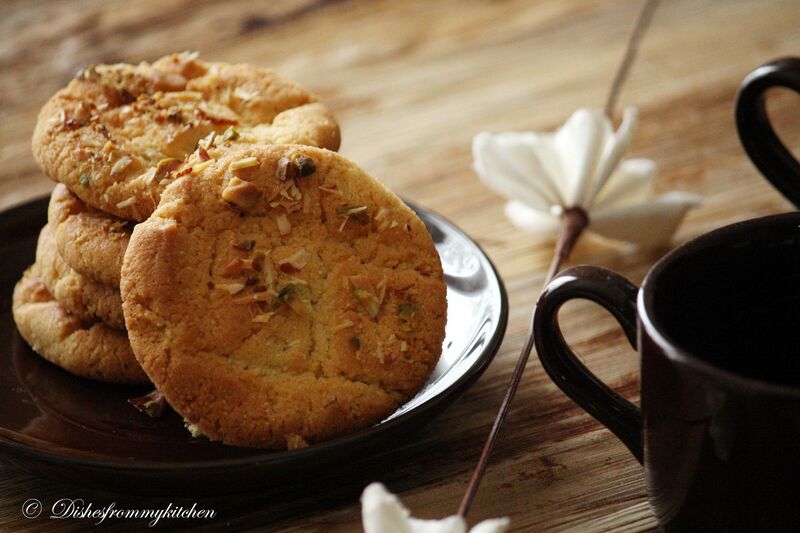 !my post is yet to come...bt nothing to compete ur pix... :)) cookies luk mre perfect!! These really do look easy and delicious! 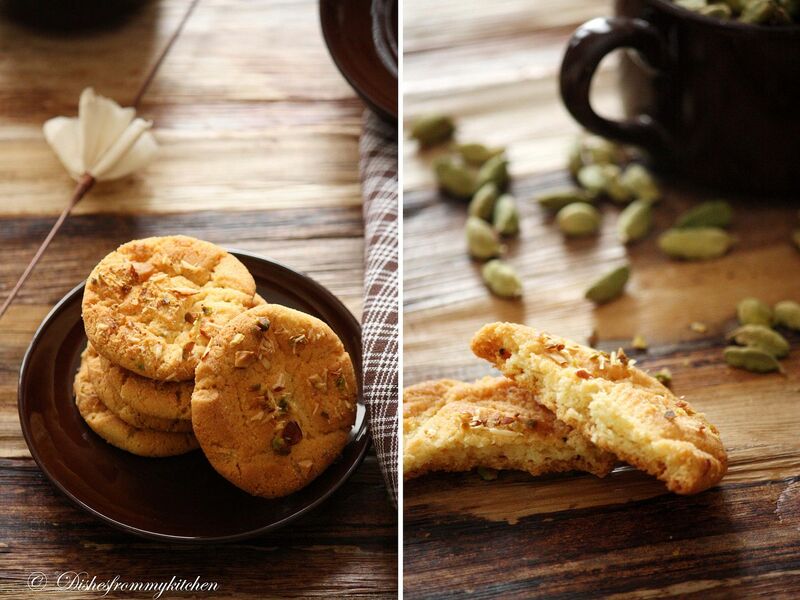 Love all the clicks and perfect little tea time biscuits..
Fabulous clicks, those cookies looks absolutely scrumptious.. The close up pics are mind-blowing!! Perfect n awesome looking cookies! Your cookies look awesome!I am sure they tasted as good as they looked. ur photographs make it feel like I can stretch my hands and grab a cookie. Beautiful cookies with lovely flavors. As always.. beautifully presented.. great cookies.. 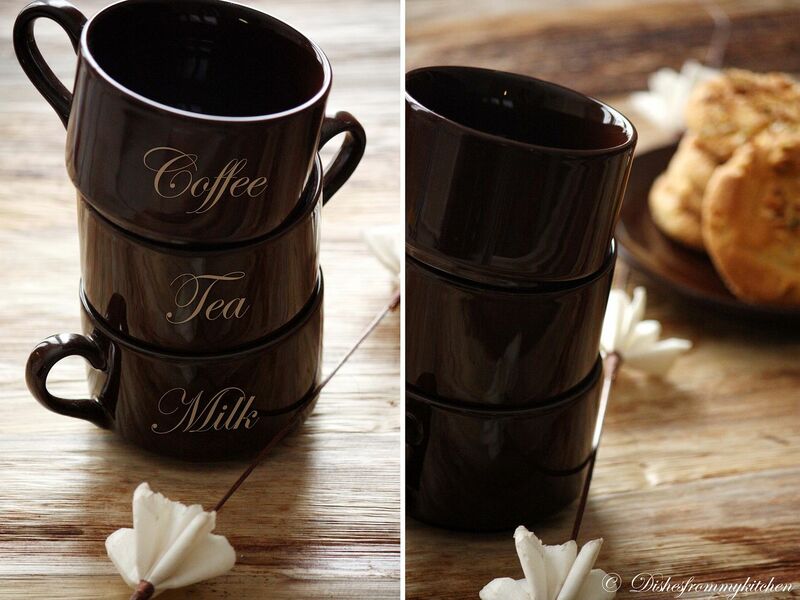 Awesome cookies & pics..love those cute coffee mugs! Looks delicious Pavi and it is eggless too. Will definitely try this. Beautiful clicks!! Perfectly backed & yummy. u r so creative dear! awesome clicks...no words,am speechless...love the cookies too. Gorgeous cookies. Loved the fact that they are eggless and nutty topping. This is a perfect my kind of cookie, am surely gng to give it a try tomorrow ! Awesomely baked cookies. 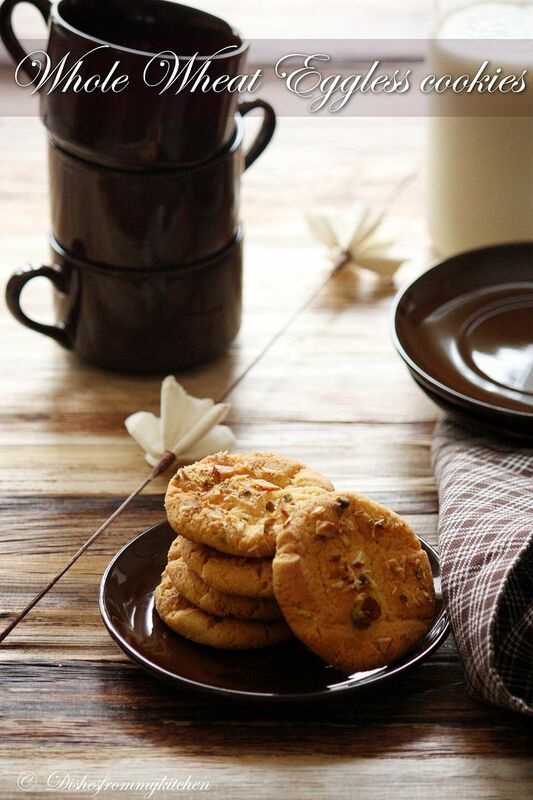 Close up pics want me to crave for the cookies. 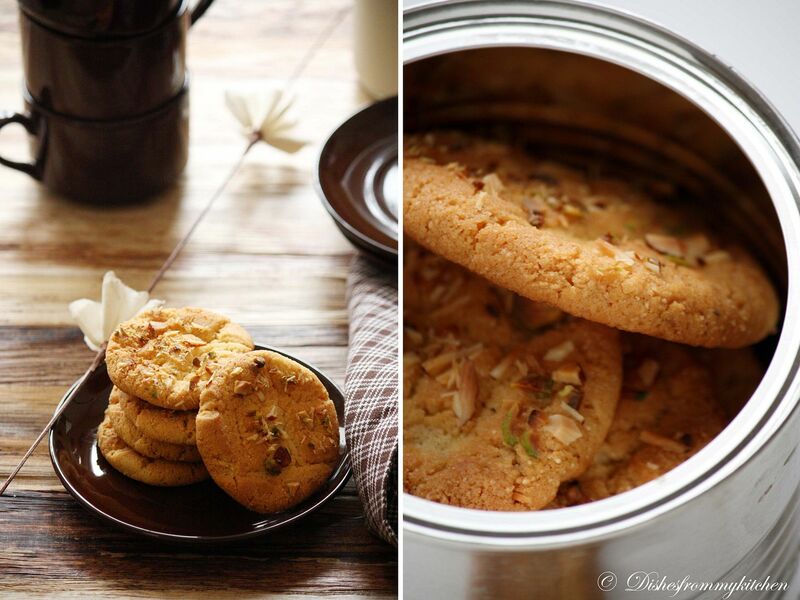 They look gorgeous...one of d best looking cookies for the sweet punch..looks yumm,y dont u parcel some for me?? Lovely cookies..what a great idea to incorporate Almond meal,I guess the addition of it would have made the cookie rich and delicious..thanks for baking with us!! 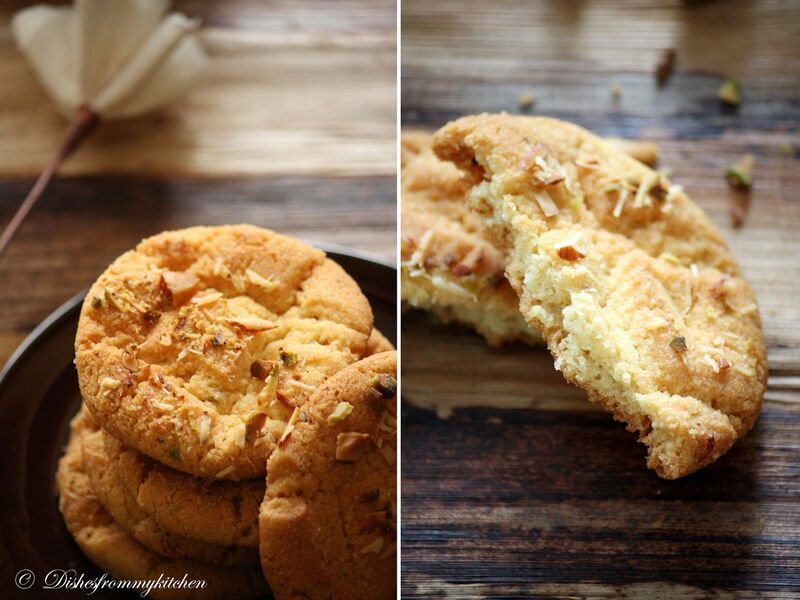 Oh what an great idea to add Almond flour to the egg less cookies, I bet it would have tasted excellent. The Cookies look very lively, the pictures make the cookies like its right near me. Hats off to your photography and creativity. Keep Rocking. Thanks for the improvisation. Awesome punch,pavithra...Luv those cups for sure,and the cookies too.. wow!! !delicious n crispy cookies!! beautiful presentation n click!! Great presentation and wonderful pics. As usual i cant take my eyes out from the gorgeous clicks.Came out so perfect and i am feeling bad for not having an oven . wow, the cookies looks very proffesional.. I am so glad you tried the almond meal and it worked well! wanted to try it, but on first try didn't want to mess up so stuck to the original recipe this time! 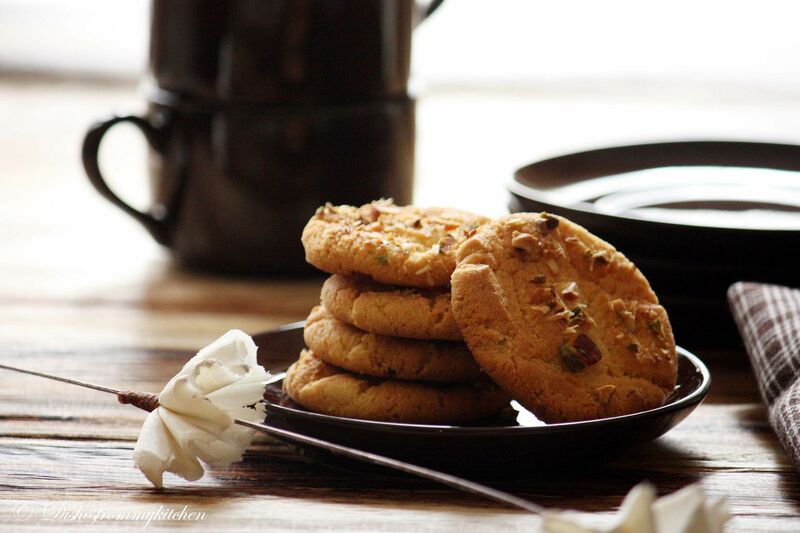 Cookies has come out very nice,as usual great clicks pavi. They have come out perfect dear and I love how you have added chopped nuts on the top and oh my, what a great presentation. These cookies look so perfect and yum!! Gorgeous clicks as usual..
You mean to say you got a chance to store these beauties? wow wow wow....Awesome pics and great recipe! I can just keep staring at those cookies forever.. Absolutely delicious. Lovely pictures. Love to have a bite with a cup of tea. Love those cookies! They look totally tempting. the fotos look so good that i just drooled over each one.. love the idea of pista in taste and the color of it..
Wonder what to admire? ur fotos or ur recipe or ur write up. Cookies are cute as usual.Thanks for the recipe. wow, This is Awesome. Love the way you photograph. Lots to learn from you. Does wheat flour mean atta flour? Anything can be substituted for almond meal? 1. Throw all the above ingredients in the tall blender with a cup of water. 2. Blend until they become smooth. 3. Strain them using the strainer, dilute with reserved 2 cups of water. ZESTY OR LEMONY QUINOA - BOTH CHECK IT OUT !! !